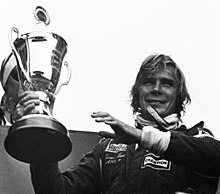 James Simon Wallis Hunt (29 August 1947 – 15 June 1993) was a British racing driver. He was best known for winning the Formula One World Championship in 1976. He later became a commentator after retiring from racing in 1979. Hunt was born in Belmont, Surrey. He was well known for lifestyle and behaviour on and off the track. He was married to Suzy Miller and later Sarah Lomax. The couple had two children, Tom and Freddie. He was also engaged to Helen Dyson before his death. He was also a close friend of Niki Lauda. Hunt began his career in the 1973 season. He entered 93 F1 races. He won a total ten official F1 races. In 1976, he won the Formula One World Championship, winning six of the official races. He won the Dutch Grand Prix (1975, 1976), Spanish Grand Prix (1976), French Grand Prix (1976), German Grand Prix (1976), Italian Grand Prix (1976), Canadian Grand Prix (1976), United States Grand Prix (1976, 1977) and Japanese Grand Prix (1977) races. During his career, he raced for Hesketh (1973–1975), McLaren (1976–1978) and Wolf (1979). He retired in 1979. Hunt later became a commentator. He was known for commentating on F1 races with Murray Walker. He was played by Australian actor Chris Hemsworth in the movie Rush (2013). Hunt died from a heart attack on 15 June 1993 in Wimbledon, London, at the age of 45. ↑ 1.0 1.1 "James Hunt". Formula One. Retrieved 13 February 2017. ↑ 2.0 2.1 "Niki Lauda: 'I wish James Hunt could have seen Rush'". The Daily Telegraph. 19 June 2015. Retrieved 13 February 2017. This page was last changed on 2 April 2018, at 01:05.